Jacek Dehnel, Lala, Trans. by Antonia Lloyd-Jones, Oneworld Publications, 2018. First-time novelist Dehnel uses his grandmother’s life and reminiscences as a springboard for a sweep through Poland’s turbulent 20th century, mingled with musings on the nature of storytelling. Though she was born in 1919, Lala’s stories begin with the childhoods of her grandparents, Polish aristocrats who inhabited a “mythical land…beyond an impenetrable wall, in the bizarre world that we agree to call the past.” The author himself is a character here, appearing first as a 14-year-old who, toward the end of the 20th century, delights in writing down and relating to friends his Granny’s tales of the way of life ended by World War I. Both Lala and her mother have complicated love lives involving multiple marriages and children not necessarily the offspring of their husbands at the time, but Granny also branches off into chronicles of the peasant brigands and thieving servants who made the family’s home turf in Lisów “the greatest bandit village on earth.” Jacek is fascinated by it all, but readers may be more restless. It’s difficult to keep track of everyone wandering in and out of Granny’s fragmented recollections, particularly during the grim World War II years, when surprisingly decent Germans, roving partisans, and then triumphant Soviets come and go in droves. What gives the novel gathering force, as Granny’s memory fails and her body deteriorates, is Jacek’s keening meditation on the transience of earthly things. Observing the garden of his family home, so lush in his childhood, he grieves: “Because I knew that with…the hacking down of every tree, with the inevitable death of each peony or rosebush that the rampant weeds had choked, came the irrevocable erasure of a primeval codex, the obliteration of ancient formulae and epic poems.” His book—this book—is his tribute to that vanished world and the grandmother who brought it to life for him. Cohesion, of course, does not mean dull chronological neatness. The material of the novel is the story – or rather the stories – of the author’s grandmother, Helena Bieniecki, the titular “Lala” (“doll” in Polish), who is succumbing to dementia. Tender and droll, rueful and rousing, these stories trace one Polish family’s journey from the 1860s to the present day against the backdrop of national uprisings, falling empires, world wars, invasions, and dictatorships. But owing to the beautifully flawed operations, to the inherent failings and embellishments of memory – which are in fact the true subject of this book – “Granny’s narrative twists and coils like a pea plant, putting out endless unexpected shoots that grab hold.” Grab hold they do, both of our sensitive guide and, thanks to his skillful retelling, of us. Is the story true? Regardless, it offers a wise and beautiful lesson in resistance, in sticking to one’s principles under duress, in demanding respect. And as Dehnel reminds us, “The repetition of wise and beautiful things is wise and beautiful in itself, and is the same sort of virtuous act as feeding the hungry, caring for animals, watering plants or donating to charity.” It may be surprising to learn that this insight, which one might expect to hear from a ninety-year-old great-great-grandmother, belongs to a man in his early twenties. Dehnel was only twenty-six when Lala was published in Poland, and only twenty-two when he had finished writing it, but he has never really been a man of his age, in any sense. In his life, his prose, and his exquisite poems, some of which were “pre-dated” by a century on first publication, Dehnel has carefully cultivated an anachronistic style, or set of styles, bringing the traditions of the past to bear on the present. Aha. Well, we still had a bit of land, so we planted potatoes. The peasants wondered how on earth I did it, because one summer I planted them too late, and on top, so they shouldn’t have done well at any price (the peasants said they’d be the size of peas and dry as a bone); but all summer it bucketed down, so while everyone else’s potatoes rotted, mine grew beautifully. The next year I planted the other way around, on soggy ground and too early, so once again the peasants tapped at their foreheads, saying it would all rot. And guess what? It was a blazing hot summer, everyone else’s potatoes dried out, but mine grew into whoppers. “Those as ‘ave been to school ‘ave been to school,” one of them said. When he walks in the street or enters a Jerusalem hotel, everyone turns to stare at him. He is wearing a brown velvet jacket, a floral shirt, a broad necktie, a black vest, and striped black-and-white trousers tucked into black leather boots. He is carrying an antique walking stick capped by a silver animal head. He might have stepped out of a fin de siecle photograph of European aristocrats - albeit without the homburg, which he left behind in Warsaw. From an antique gold chain dangling from a pocket hangs a large jewel; part of the chain is connected to a shell-shaped box that contains antidepressants or small change, another part to a watch. "Lala" is also the story of the Polish aristocracy and intelligentsia, of china and highly polished manners - all of which are disappearing. Dehnel is a master of the Polish language, with its different registers and subtleties, and the excellent Hebrew translation by Boris Gerus preserves, with irony and amusement, Polish's melody. Fascinated by his grandmother's life story and enthralled by her colorful personality, the author conducts conversations with her and transcribes them almost verbatim. The plot is founded on Lala's memories, and she lures him to the place where it all began. As the story progresses, her memory and Dehnel's maturation undergo opposite processes: The old woman's memory grows hazy and fades, while the narrator, the little boy, grows from being a passive listener into a man who, at a certain stage, takes command of Lala and her memory and finally adopts a properly detached adult point of view. Granny Lala was born in Kielce in 1919. Her first husband, Julek Rogozinski, was a translator of French literature. Her second husband, Zygmunt Karpinski, Dehnel's grandfather, was a forester. Dehnel's paternal grandfather was an officer in the Polish navy, captured by the Germans in World War II and incarcerated in a prisoner-of-war camp; his father, Jacek II, was born in Gdynia, a port city on the Baltic Sea. Dehnel: "In the 1960s, my grandfather was transferred to Gdansk, which is close to Gdynia, and in the 1970s my parents met and married and thus I was born." He and his brother, two years his junior, grew up in Gdansk, the city of Lech Walesa. His father works in computers and his mother is a painter. As a boy, Dehnel spent a great deal of time with his grandmother, Lala, who lived nearby. From a young age it was clear to him that he, too, would be a painter. "Mother painted in gouache and tempera, and I also painted a great deal during these years, but because I was asthmatic I could not paint with oils," he explains. "I studied at the academy of art, but could not take part in the oil-painting workshops. All I could do was learn the theory and draw or paint in aquarelle. Talent? Well, I had some sort of talent, but it's the same with writing. Talent is one thing and hard work is something else." He also began to write poetry at a young age: "That happened by itself. I was a smart-aleck kid. We had an open house and I was always present when my parents entertained. I read a lot, and in comparison with most 10 year-olds, I had a very coherent, broad worldview. According to our house code, it was clear that every person must express himself artistically. One did not have to be a piano virtuoso but, for the sake of personal development, one had to do something: play the guitar, paint in aquarelles, scribble in the margins of notebooks - the main thing was to be creative. At the age of 18, Dehnel entered the University of Warsaw's humanities program. He still believed he would earn a living largely from painting and that writing would be only a hobby. "I painted large works in the style of the French Symbolists, the way people painted in the fin de siecle period," he recalls. "I showed works in exhibitions and I still have paintings at home which I find difficult to part with." At 19 Dehnel started to send poems to literary competitions, winning prizes. His name began to stir interest in literary circles as the next hot thing in poetry. His first poetry book was published in 2004 and earned him the Koscielski Foundation Literary Award - Poland's second most important literary prize. "That helped," he says. "Things began to get easier." He has published several books of poetry and his poems have been translated into French, Basque, Gaelic, Lithuanian, Slovakian, Slovenian and English. Dehnel started to work on "Lala" at the age of 20, but after completing the novel did not try to contact a publisher. His new book, to be published this fall, pursues the theme of romantic nostalgia and includes a collection of old photographs Dehnel collected or bought in flea markets, juxtaposed with literary texts that uncover the secrets underneath the graphic images. Why does someone so young revel in past history instead of looking toward the future? "I think it is the role of parents and grandparents to make sure young people know the world did not begin yesterday, but has been around for a few years. I am aware that this soil on which we are walking is covered by a thin layer of dust we created, but beneath it are a great many other layers that were created by earlier generations. It is my feeling that every word I use, and all the things around us, were here long before us and will remain long after we are gone." All the women in "Lala" are strong and independent, the men far less so. Dehnel always thought this was the case in his family only, until he says he discovered that these traits are typical of all women. "It is also typical of Poland," he notes. "Men fought in the wars and took part in the rebellions, and women stayed behind and looked after the house, the children, even entire estates. So it happened that a woman, who formerly was weak and pale and spent her time playing a grand piano, suddenly was compelled to deal with large property holdings and to see to the livelihood of the family and the workers." Lala's family had two such estates in the Kielce area. Over time they fell into disrepair, just like the aristocracy and the intelligentsia. "If the national character of the Poles can be summed up in a word, it is poetry," Dehnel says. "Every Pole is a potential poet." In addition to being a full-time writer and poet, he works in television as an editor and hosts a weekly cultural program. "That made it possible for me to buy an apartment, for which I am still paying," he says, "because to make a living from literature alone is a bit difficult." "For the pose - and for the asthma. It gives me confidence in the street. At first I walked with an umbrella and now with a cane. I have a collection of antique canes. But maybe it is really more because of the facon. One of the advantages of homosexual relations is that one can exchange clothes with one's boyfriend. Yes, I have had a boyfriend for five years now, and my impression is that this will not change soon." Dehnel's family responded to that news with mixed feelings - his mother far better than his father, who perhaps understood that in Poland's intolerant climate, the prospects for a Jacek IV are not great. Dehnel did not come out of the closet publicly, but is also not secretive about his identity. He believes that the more exposure the subject gets, the more naturally the phenomenon will be accepted in Poland. "I never made a fuss about it. I went out with boys freely and openly," he explains. "The formative experience was the first time I saw the film 'The Neverending Story.' I must have been about eight. I took a great liking to the boy and felt that something odd was happening to me. That was my first awareness of my sexual difference. I had my first boyfriend at age 17, but my parents suspected nothing until I told them. "Parents," he continues, "have a rare ability not to see things and to ignore even telltale signs. It was immediately clear in the broader sense as well; even before I began to become famous, I wrote love poems in the masculine case. But I never went public and did not turn it into a circus, as people sometimes do when they confess in tabloids." Most gays and lesbians in Poland lead a secret life, Dehnel adds: "I can count on the fingers of one hand the number of famous people who have come out publicly, and this has implications for society as a whole." His partner, Piotr, is 26 and is working on a Ph.D. in history. They bought their apartment together. A number of Jews entered Dehnel's large family through marriage in earlier generations, but left no legacy to speak of. When the Nazis built concentration and death camps on Polish soil, the Poles knew they would be next in line, Dehnel says: "Today, when I walk around Warsaw, I cannot forget what happened in those streets - the poverty, the ghetto, the executions, the Umschlagplatz [where Warsaw Jews were collected for transport to death camps]. It is terrible. For me, the Jewish fate and the Polish fate are intertwined." Did your grandmother also tell you about the pogrom perpetrated by Poles against Jews in Kielce after the war? "During the war, Grandma was no longer in Kielce, but in Warsaw. But yes, she knew many Jews, friends and acquaintances, and felt terrible about what happened." Lala died a year ago. "During her last years she was quite cut off from things," her grandson says. "She stopped talking and responding. She just sat in an armchair or lay in bed, and communication with her was generally limited. Sometimes, though, she would snap out of it and throw herself into life tempestuously. This is the mysterious nature of storytelling: the same start can also mean different endings, and different starts can lead to the same finale. It's all subordinate to the greater narrative, which starts somewhere in Kiev. This beautiful book is exactly that, the mysterious art of storytelling. The wayward meanderings of memory, of tangents and digressions, of side notes and elaborations, but above all that of affection; for both the story and the storyteller. What makes us who we are if not our culture and heritage and in this book our narrator re-lives and re-tells the story of his heritage told to him by his grandmother. To describe the plot of this book is difficult; it's like trying to hold water, and that is the wonder of this book. The story is really a great string of memories; of Jacek Dehnel's own memories of his grandmother and his memories of the stories she told of a great cast of characters, family members, neighbours, even Madzia-who-brings-the-milk. These stories of memories pick up and drop off, fly off at tangents, both our narrators and his grandmothers, so as a reader it is hard to hold a specific sense of who, where and when. Instead, the reader is left with a glorious sense of impressions, a sense of who people are rather than what people did. Added to that, the memories are told by Dehnel with a great sense of humour and affection for both the stories he is telling and for his elderly grandmother Lala. This book won the Paszport Polityki Award and it is not hard to see why. I particularly loved the photos scattered through the book, they range from 1900 to 1995 but are all in black and white, which adds a uniformity and dignity to them, especially as Lala ages. It adds a sense of depth to the memories shared when the protagonist of the current story is regarding you as you read. This book is less like reading a novel but rather looking through a friend's photo album as they reminisce about their life and events. It rather adds to the tone of the book that the photos are increasingly scarce around the times of the greatest upheavals, the Revolution and the two World Wars; there is the added sense of survival being more important and of things forever lost. The book as a whole is wonderful; all events are told with the sense of humour that the human character uses to get through difficult times. Lala's father escaped the Russian Revolution, Lala and her family lived through both World Wars, and Dehnel recounts the nightmares they suffer because of it, but we see a sense of the strength of Lala's spirit in the tales she tells. For me, though, the real beauty of this book comes towards the end as Lala gets older and older and starts to fade. Her memories fade, events become muddled and she suffers from senile obsession but her strength of character continues and Dehnel, without sugar coating events, continues to pay tribute to her strength of character as they try to deal with her loss of health and the family rally round to make the most of her before she dies. Dehnel's honest representation of the end of an era is so moving, it is not sentimental or morbid but rather it is the plain re-telling of the final months and days of a woman who has been at the centre of his world. Jacek Dehnel, Aperture, Trans. by Karen Kovacik, Zephyr Press, 2018. The poet brings his fascination with formal poetry to 21st century subjects ― internet culture, science, postmodern architecture ― even as he also explores intimacy, gay love, and emotionally-charged objects in this bilingual (Polish/English) collection. Dehnel’s range of style and diction includes poems based on the classic Polish thirteen-syllable line and intricate rhyming stanzas, to prose poems and freer lyrics. “My restlessness… is one of my strongest traits―that insatiability for places, books, paintings, people,” he says. Jacek Dehnel’s first full collection in English spans the past 15 years and includes work from four of his Polish collections. His translator, Karen Kovacik, has chosen to order the collection according to theme or feeling rather than chronology, so the English-language reader is better able to explore the resonances and enduring preoccupations of this elegant, lyrical poet. This approach pays off: Aperture offers a generous selection that gives a good sense of the arc of Dehnel’s important and underrepresented work. the hole glazed with wafer-thin, fresh ice. Dehnel excels in the detail of life: the lacquered surface, the hairdryers on their hooks, the smell of charcoal and varnished floors in the empty school in summer. This detail furnishes and fleshes out the picture; it also serves, like the medieval symbols of vanitas, to remind us of the transience of our own lives. Transience, and the melancholy that accompanies it, are key notes in a number of the poems: the gorgeous “Pheasant”, (written on a passing train) contrasts the bird’s immortal insouciance with the man’s namelessness: “That’s why I write: he came / to the railway, his name: pheasant. Me, I have no name.” From the same collection, the long poem “Fig. 370. Hunchback due to tuberculosis of the spine” is an extended meditation on the life of a young hunchback who features in a pre-war medical photograph. His grotesque deformity is record- ed with the same loving attention as his frailty (“that solitary hand, / suspended free before / him in the morning light”) and the poem muses on his eventual fate as a dosser, a beggar, in some imperial Eastern European city. This elegy in soft sepia tones focuses on masculine sensuality even in deformity, and its loving gaze rescues this unfortunate cripple from objectification as a medical specimen, a sufferer and a pauper. We learn perhaps only at the end of the poem that the man is naked. He dresses behind a screen and bids the doctor goodbye. In the poem his dignity is restored by the poet: he is a man, with a man’s frailty. Jacek Dehnel, Saturn, Trans. by Antonia Lloyd-Jones, Dedalus 2014. 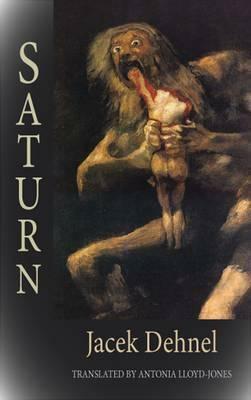 Saturn is a fictionalised version of the personal life of the great Spanish Painter Goya. The story is narrated by Goya, his son Javier and his grandson Mariano. The deeply flawed relationship between the three generations produce an atmosphere of psychological tension.The story is built around the theory that Goya's horrific series of Black Paintings were in fact the work of his son Javier, and were Javier's way of expressing his feelings about his father. Each of the paintings features as an illustration within the book. Jacek Dehnel has written a fictionalised account of the last years of the lives of Goya, Javier and Javier’s son Mariano, working on the basis that Javier did indeed paint the Black Paintings, and it makes for a fascinating read. The book interweaves first person diary-style accounts from each of the three men; the embittered Francisco, the other-worldly and confused Javier and the scheming Mariano. As the book progresses a very credible story builds up which includes Javier beginning to paint the first few of these 14 paintings. Francisco on the other hand was a riotous, philandering, boastful man who saw every woman as a potential conquest, even trying to seduce Javier’s young wife soon after Javier brought her to live in the family home. When the book opens, Francisco has achieved considerable success and the family is wealthy, living in some style. The house is full of expensive art materials, many of them toxic, and as we read the alternating voices of the Francisco and Javier we gain an impression of an artistic chaos which does nobody any good, but which provides fertile ground for a sort of tortured creativity which goes some way to explaining the choice of the themes of the Black Paintings. I am not sure I would have liked Goya very much as he is portrayed here. He was given to outbursts of rage both against his family and the world in general, and was constantly unfaithful to his long-suffering wife. He never thought his son would amount to much and regularly criticised and put him down. In examining their relationship, the author builds up an atmosphere of psychological tension. The author himself (who is Polish), apart from being a writer, is also a painter, and his intimate knowledge of the visual arts is very apparent. One very telling insight is that Goya could paint faultlessly such things as gold braid, sashes, faces, breasts under muslin and the neck of a plucked guinea fowl, but every horse he painted was “like an oversized dog”. The main body of the story is told in the form of monologues by Goya and Javier, each giving something of themselves, the expectations they had of each other and the failures. Later still the role of Goya is taken over by his grandson Mariano, arguing with his father about the fate of the house in which Javier has painted murals on the wall, compositions so grotesque as to call into question his sanity. And thus, with three generations of the family given a voice, the title is explained – the mythological Saturn, who as the Greek Cronus overthrew his father Uranus and was in turn overthrown by his son Zeus. The end result is a fascinating book, one in which the story is filtered through three distinct personalities, with the reader left to decide how much to rely on each. We have the great artist Goya, willing to do anything to survive, feeling that he has done his best for his son but disappointed at the latter’s failure to succeed as an artist in the same mould as himself. Contrarily Javier thinks that his father has let him down, that he has been abandoned and his efforts disregarded, and he consoles himself by mocking the commercialism and pragmatism of his father. Then again we have Mariano, an arriviste to the bone, looking at everything in terms of its monetary value and how it will help him to progress in society. The interplay between the three is engaging, touching on such themes as art versus commerce, principles versus pragmatism, and as a side issue there is a gripping account of aspects of the Peninsular War, with the compromises of Goya mirrored in those made with Napoleon by his nation.